With the general election on the horizon, Donald Trump remains prone to unpredictable and sudden policy changes, but this one may take the cake. 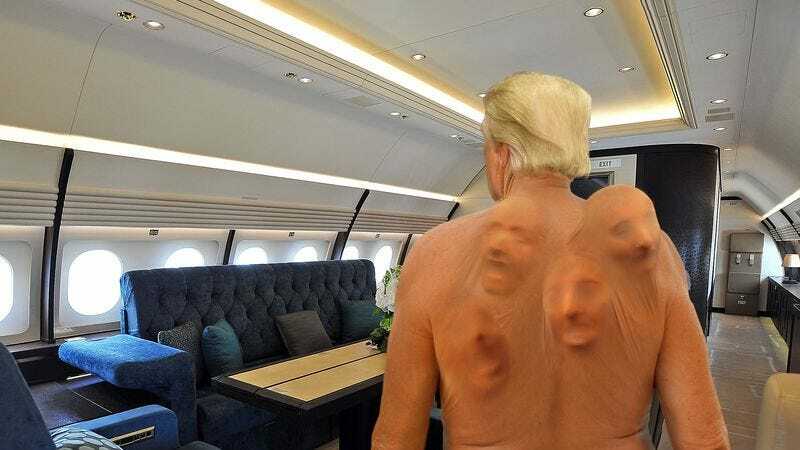 The GOP candidate said in a speech earlier today that he wouldn’t rule out granting citizenship to the moaning children’s faces growing on his back. Wow. This is a drastic swerve for Trump’s campaign. Trump’s hard-line position on immigration helped propel him through primary season, which makes this sudden reluctance to side against the wailing faces of children breaching his skin all the more unexpected. Seeing him soften his stance on a tentpole issue this late in the game just proves anything can happen between now and November. In any case, it’ll be fascinating to see how Trump’s anti-immigration supporters adapt to this new position, especially with pundits predicting the faces’ guttural whinnies and violent twitching to only grow in frequency and intensity as November approaches. The plot continues to thicken!